The common perception of monkeys tends to be dominated by a relatively small number of species, generally those most commonly seen in zoos, such as capuchins, macaques, baboons or tamarins. But as is usual when it comes to biodiversity, there are a lot of varieties of monkey out there that may be less familiar to the general public. 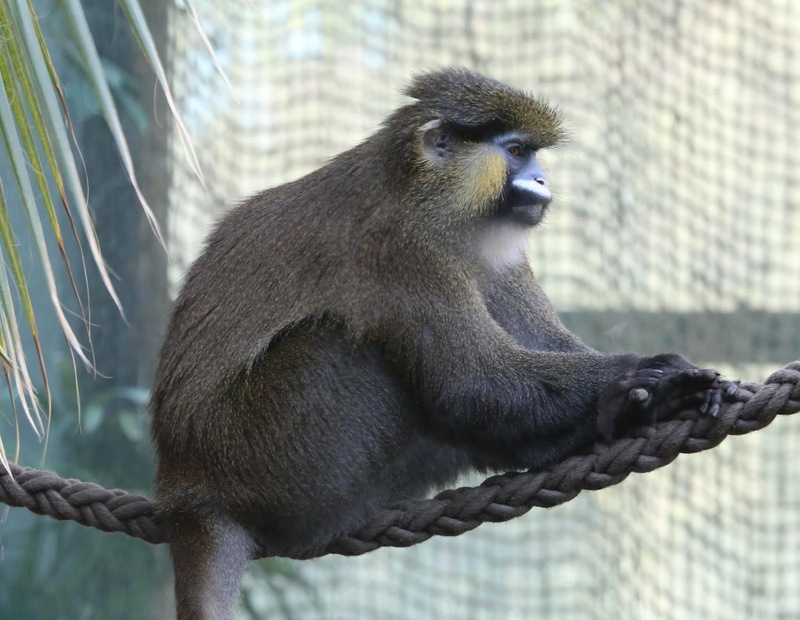 This post will look at one of those less familiar groups: the guenons of the genus Cercopithecus. Moustached monkey Cercopithecus cephus, copyright Rufus46. 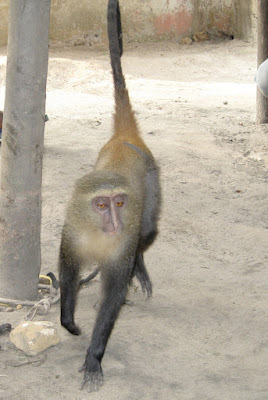 Cercopithecus is a genus of monkeys found in sub-Saharan Africa. The exact number of species has shifted around a bit (though it currently sits around twenty). Some authors have included almost all species of the monkey tribe Cercopithecini, characterised by self-sharpening lower incisors and four cusps on the lower third molars (Lo Bianco et al. 2017), in the single genus Cercopithecus. However, more recent authors have tended to favour dividing this tribe between a number of phylogenetically and ecologically distinct genera. Under this latter system, Cercopithecus would be restricted to a group of more arboreal species. A number of these species have been divided between multiple subspecies and there may be some back and forthing about what is recognised as which. One entirely new species, previously not even known as a subspecies, was described as recently as 2012 by Hart et al. : the lesula C. lomamiensis. Young female lesula Cercopithecus lomamiensis, from Hart et al. (2012). A large part of this uncertainty relates to the fact that Cercopithecus species are most diverse in dense forests of western and central Africa, in regions that may be both physically and politically difficult to access and which have received less attention from researchers than others. The aforementioned lesula was described from the Lomami River basin near the middle of the Democratic Republic of the Congo (the one that used to be called Zaire, though I think they prefer not to talk about it). Another Congolese species, the dryas monkey C. dryas, was long thought to be known from only a single juvenile specimen until it was realised that the adult form had been described as a separate species C. salongo. It's still only known from a handful of records and is thought to be critically endangered. Diana monkey Cercopithecus diana, copyright Ikmo-ned. 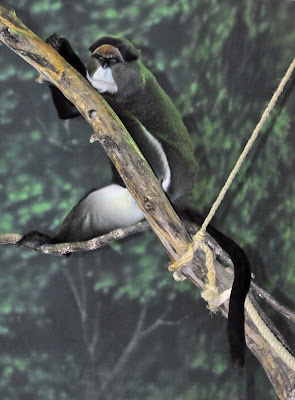 Some species of guenon are notable for their striking colour patterns. Perhaps the species I've most commonly seen in zoos is the diana monkey C. diana, native to the region between Sierra Leone* and the Côte d'Ivoire (though it is possible that at least some of these 'diana monkeys' were actually roloway monkeys C. roloway, until recently treated as a subspecies of the diana monkey). This species has a bright white throat, chest and front of the fore arms that contrasts with the black face and dark grey back. It also has a white band across its brow which is where its name comes from, the band having been thought to resemble the crescent moon. De Brazza's monkey C. neglectus of central Africa has a crescent-shaped orange mark on its forehead and a white muzzle and beard, making it look reminiscent of a grumpy old man (Wikipedia claims that it has also been dubbed the 'Ayatollah monkey'). Male De Brazza's monkeys also have a bright blue scrotum. Large bright blue patches are also present around the scrotum and backside of males in the lesula and the owl-faced monkey C. hamlyni. *Having grown up in New Zealand in the 1980s, I'm going to have that stuck in my head all day now. Nothing to do with the subject of this post, I just thought I'd mention it. Male De Brazza's monkey Cercopithecus neglectus, copyright Heather Paul. Guenons tend to be found living in small troops consisting of one adult male and a harem of females with their offspring; unmated adult males will be found living solitary lives. Males are usually larger than females, up to about 1.5 times the size of their mates. 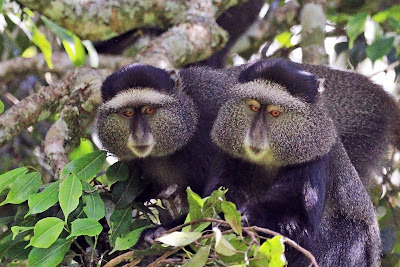 Multiple guenon species may be found in a single location though closely related species tend not to overlap. Famously, hybrids have been described from the Kibale forest in Uganda between the blue monkey C. mitis and the red-tailed monkey C. ascanius, two species that are quite distinct in external appearance. Larger species such as the spot-nosed monkey C. nictitans and the blue monkey tend to eat a higher proportion of leaves in their diet. 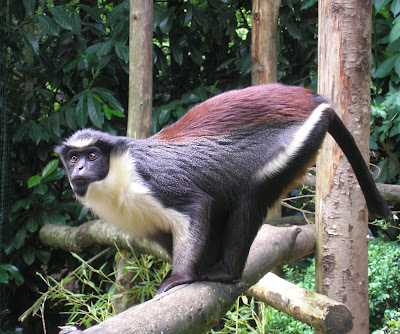 Smaller species such as the mona monkey C. mona may be more insectivorous (Macdonald 1984). 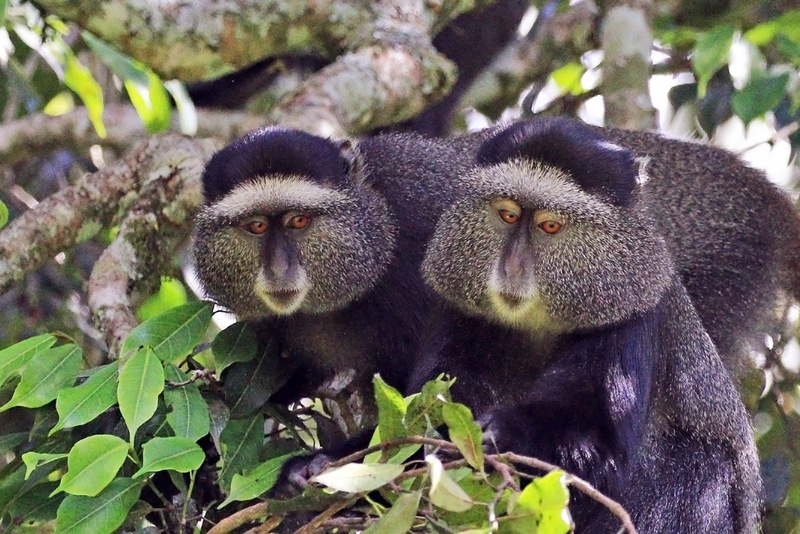 Blue monkeys Cercopithecus mitis stuhlmanni, copyright Charles J. Sharp. The origins of the Cercopithecus radiation are relatively recent with the tribe Cercopithecini as a whole probably originating in the late Miocene (Lo Bianco et al. 2017). Karyological studies of the group show a wide variation in chromosome number from 58 in the diana monkey to 72 in the blue monkey. In contrast, the sister group of the Cercopithecini, the Papionini (which includes baboons and macaques) always has 42 chromosomes. Polymorphism in chromosome arrangements has also been described within Cercopithecus species. The possibility that this gene variability is related to their rate of speciation remains a worthwhile line of study. Hart, J. A., K. M. Detwiler, C. C. Gilbert, A. S. Burrell, J. L. Fuller, M. Emetshu, T. B. Hart, A. Vosper, E. J. Sargis & A. J. Tosi. 2012. Lesula: a new species of Cercopithecus monkey endemic to the Democratic Republic of Congo and implications for conservation of Congo's central basin. PLoS One 7 (9): e44271. Lo Bianco, S., J. C. Masters & L. Sineo. 2017. The evolution of the Cercopithecini: a (post)modern synthesis. Evolutionary Anthropology 26: 336–349. Macdonald, D. (ed.) 1984. All the World's Animals: Primates. Torstar Books: New York. Despite the relative unfamiliarity you mention, the guenons are in some sense "the" Old World monkeys, the eponyms of Cercopithecidae. Is there a story as to why the family was named for them? Not that I've been able to find. Linnaeus used the name Cercopitheci (as a subgroup of his genus Simia, a name that has since been suppressed) for long-tailed monkeys in general, including a range of African, Asian and South American species. Why, as the genus got progressively whittled down, it came to be associated with the African species in particular I don't know. Marggraf, a couple of pages earlier, also describes and pictures a cercopithecus from Brazil that, allowing for the illustration style, looks like it was probably a spider monkey. The Gessner illustration at your second link is particularly interesting in that, a couple of pages earlier, he provides a quite realistic depiction of a 'cercopithecus'. I think a point might be being made but I can only wish my Latin was good enough to tell what it was. My big question, though, is what is that thing on p. 96? Not the tamarin, the one that looks like Peter Lorre had a regrettable drunken encounter with a hedgehog. "what is that thing on p. 96?" It's a (highly stylized) sloth. I... suppose I can see that. If we presume the artist had never actually seen a sloth and just had one described to him. As that thing has three claws on its forelimbs, it's apparently supposed to be a three-toed sloth Bradypus sp. Three-toed sloths are even today quite difficult to keep in captivity (two-toed sloths Choloepus sp. are hardier and therefore much more common in zoos). A three-toed sloth would have been unlikely to survive the sea voyage across the Atlantic from the Americas to Europe in the 16th century. Thus, it's a good bet that Gessner based that rather atrocious image of a sloth on either a skin or on hearsay.